I get a lot of questions about how to get from Jeddah to Makkah to Medina for Umrah. I was very lucky to have an awesome friend who provided me with a driver for my Umrah, so I was driven to Makkah and Medina by car, which I must say was great as it made everything so much easier. May God bless them for kindness and generosity. I know however that many people will not have this benefit and they will have to rely on other means for their journey from Jeddah to Makkah and Medinah for Umrah. 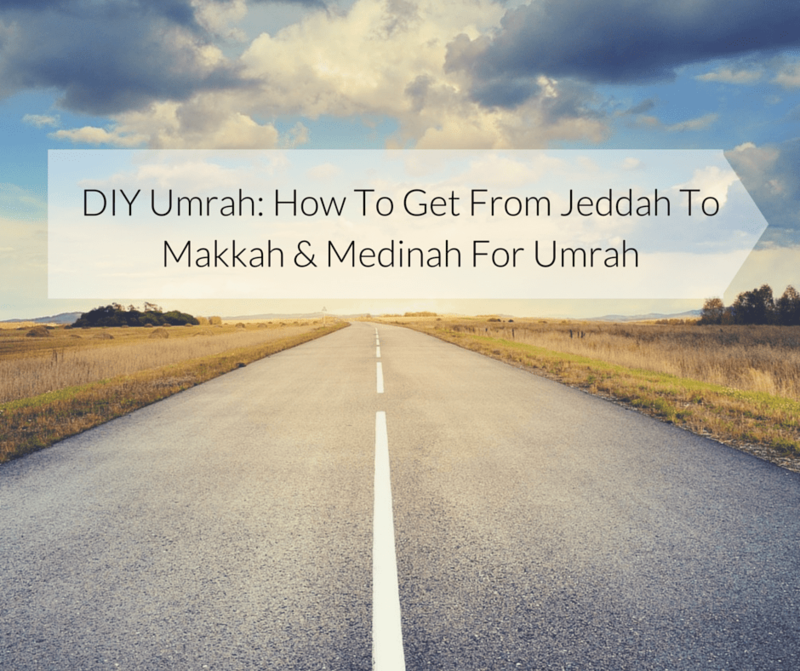 So here is the best guide you will need to read when going from Jeddah to Makkah for your Umrah. If you want to know more about my best way to get to Medinah check the post at the end of the article. The best and easiest way to get from Jeddah to Makkah is by getting a taxi from the airport. You will have to negotiate the price with the driver but the average that all of my clients and friends pay is about $40 or 350SAR for a taxi. Mekkah is only 50-60 minutes from Jeddah depending on traffic. If you arrive late in the evening like us then there is much less traffic. You can also order an Uber service since they are available in Jeddah and they will drive you to Mekkah. Although it will cost you a little extra you will have the choice of following the route and more security that comes with Uber. You can read more about Uber and how to use them here. Also, Careem is the local version of Uber and it offers the option for rides even within the cities of Makkah and Medina. So if you want to go for example to Masjid Kuba you can take a ride with Careem rather than negotiating with a taxi outside your hotel. This definitely makes it more affordable and easy for the pilgrims. If this is your first time you can use my link and receive a discount on your journey. There are also private companies that you can rent a driver and a car for a day or even a week if you need. These prices vary but you can find someone from as little as £100 for two days. You will have to negotiate with them and arrange prices and always make sure you have copies of correspondence and prices with you. Another option will be to actually have a car arranged by the hotel to pick you up from the airport and drop you directly to the hotel. This costs considerably more than actually getting a taxi yourself or even an Uber since each hotel has different prices. You can check for the transportation options with your respective hotel. If you are planning on visiting Medina while you are there you have a couple of options. You can fly in directly to Medinah airport from your country and then drive to Mekkah. This is a great option and it can be done in reverse as well. It saves you considerable time since Medinah is approximately 5 hours drive from Makkah or Jeddah Or take the new highspeed train. Earlier this year Saudi announced that the so anticipated highspeed train will be starting to operate. Well, it has, and after a few months, the reviews are good. This is a great way to travel from Makkah to Medinah as the train takes approximately 3 hours. It is much safer than driving or taking a car and much faster and more comfortable. Currently, the train doesn’t operate at full speed which should be around 300km/hr but rather at 200km/hr. Still, it is a very good alternative and I am happy it is working fine. You can book tickets online for this train here on their website, which is in English. Prices for one way per person are 150 SAR / £32 pp. The ticket is higher than other modes of transport to Medinah especially for families as it does add up if you want a return ticket. My best advice will be to take a one-way route from Makkah to Medinah and then an open jaw flight as I have discussed in this article here. Note that the train doesn’t work best for Jeddah to Makkah as it doesn’t have a stop at the airport. You can also book a flight from Jeddah to Medina for about £60 return which is not a bad choice if it costs more to book your flights directly to Medina with another airline. Just remember that you will have to collect your luggage and re-check yourself if you are flying directly after landing. The best way to find the cheapest flights to Medinah is by using Skyscanner as it shows you the options you have for the whole month or even the cheapest month. The cheapest and more convenient option for those who have first visited Makkah is to use the VIP SAPTCO coaches and travel in comfort to Medinah. SAPTCO is owned by the Saudi government and it stands for Saudi Arabian Public Transport Company. It provides a great and cheap way of travelling between the two Holy cities. Prices for the tickets cost approximately £35 return and they are well worth it. 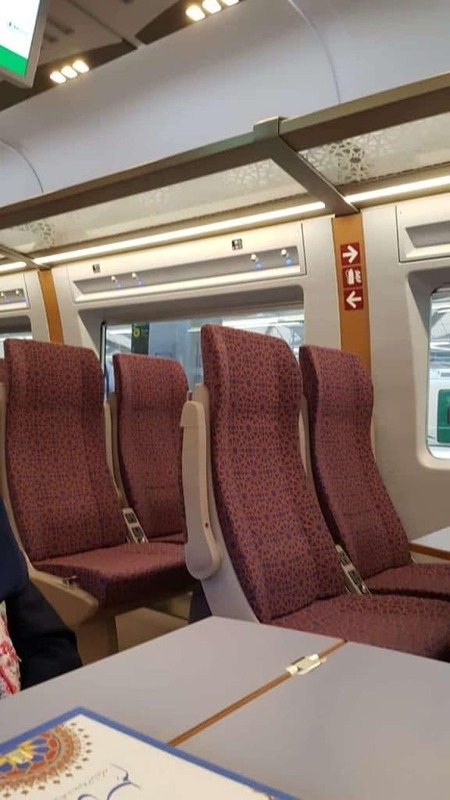 You have a nice comfortable chair and free refreshments provided on the journey. Just make sure you book the VIP service and not the regular coach. You can buy your tickets from Mekkah coach station, make sure you go to the normal station and not the VIP stand since it is not manned, a few days prior to your travel. 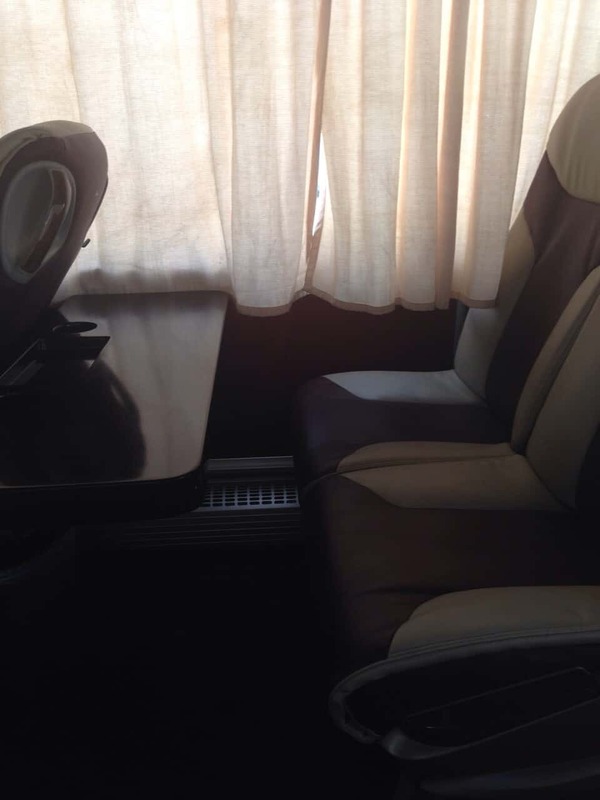 This service is comfortable and the drivers are careful and they arrive on time which is always a bonus in Saudi. You can also now, book your service on the SAPTCO website. Tickets can be book about two weeks in advance. This is great if you are going in a busy period and you want to make sure have a seat. Locals told me to never take a taxi from Makkah to Medina as it is not safe on the motorway due to many drivers speeding. I would also recommend the same to you. I would also suggest for you not to rent a car and drive since that choice seems to me even more dangerous. The road signs are OK however the driving style is more of a freestyle and especially if you come from a country that drives with rules you will find it frustrating at the least. Recently there has been introduced a sightseeing bus in Medinah which you can take to visit the 12 historical places of the Holy city. I really like the idea of these busses because they are an easy and convenient way to explore a city. We used them in New York and I will happily use them next time I am in Medinah as well. You can always leave the bus, explore at your own time and then wait for the next bus to take you to the next destination. Simple! Here is the link for the website, the bus runs every day all year around with bus frequency of 30min and each ticket costs £17 per person. Your other option if you want to visit some of the historic sites in Makkah and Medinah during your Umrah you can negotiate a price with a taxi driver. We did the same in Medinah and it was pretty reasonable. So I would rather go with the tour bus than having to deal with that on Umrah. I guess introducing the tour bus it is a lesson for taxi drivers too. Dear Muslim TravelGirl.A salute to you for a much awaited and needed DIV Umrah. It is the general opinion that only Umrah agents can facilitate Umrah, especially if one is woman. You have proven that a lady/ ladies can plan own itinerary quite safely,tho much preparation ( viz. bookings for hotel,tours,etc)needs to be done beforehand. I think a brave lady before her 50’s can handle solo Umrah. I would not recommend for senior citizens who may panic during an emergency. ( You didn’t state your age tho)Anyway,thank you v much for a helpful DIY Umrah! 1. How to get to Saptco station in Jeddah from Jeddah Airport. 2. Where is the exact drop off location in Mecca and Medina. It is near to Al Haram? When leaving Madina for Makka. Always try and leave, immediately after Fajr or after Asr. In order that you arrive in Makka when the roads are not congested. Should you arrive during a waqt, be prepared for a long walk with luggage to your hotel or the Haram. Or long sit in the taxi and an irritated driver. Always remember that your labayk is your connection with Allah during those testing times. Excellent tips 🙂 Thank you so sharing and I hope others benefit too inshaAllah. Assalamu Alaikum. I am planning for my umrah on Jan -2016. I will be arriving at madina. Then I need to drive from madina to makkah with Ihram. Do you know where is the meeqat for ihram when travelling from madina to makkah. Does SAPTCO stop at meeqat ? Walikum Salam Ameen, The SAPTCO bus stops at the meeqat as many pilgrims use this service. I believe it stops for meeqat at the Dhu’l-Hulayfah (Masjid-u-Shajarah), this has shower facility for wudhu but it can be crowded. You might want to wear your ihram from the hotel. Yes it is safe and many families do this for Umrah from jeddah to Makkah or Medinah. I am planning to visit Makkah late February this year with my family for Umrah. What is the best cheap way to travel to Medinah after my Umrah and at what times. I know the SAPTCO bus station is a little far from the Haram in Makkah. How far is it? What will a taxi cost to the Bus Station? I noticed it is now possible to book a bus ticket online. 120 riyals from Makkah to Medina VIP and 65 riyal Normal. This is a really good price in comfort. Great advice and article as always. On my recent umra trip(Ramadaan 2016) I used the VIP Bus service from Makkah to Madina and I used the normal Saptco bus service from Madinah to Makkah because the VIP service was fully booked on Eids day. 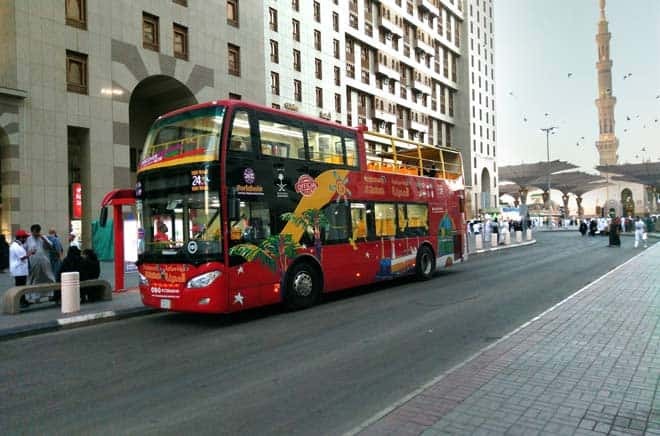 The Bus service leaves from the Makkah bus station which is not very far from the Anjum Hotel in Makkah. If you have big luggage it is best to take a taxi to bus station. Ask the taxi driver to drop you at Jarwal Saptco Station. The bus drops you off at the Crowne Plaza hotel which is very close to the Haram in Madinah. There is also a SAPTCO office next to the hotel where you can book bus tickets. VIP bus service is excellent. Refreshements are given and there is a toilet inside.The space is awesome. The normal Bus Service leaves from Madinah Bus Station(About 2km) from Haram. The VIP bus service leaves from Crowne Plaza hotel.The normal bus service is also good. No refreshments though. It was comfortable and air conditioning was also good. The bus stops at Meeqat at Dhul Hulaifah. May i know, from Haj terminal Jeddah, what is the nearest bus station for VIP service to Madinah? How many seater Coach for VIP service? 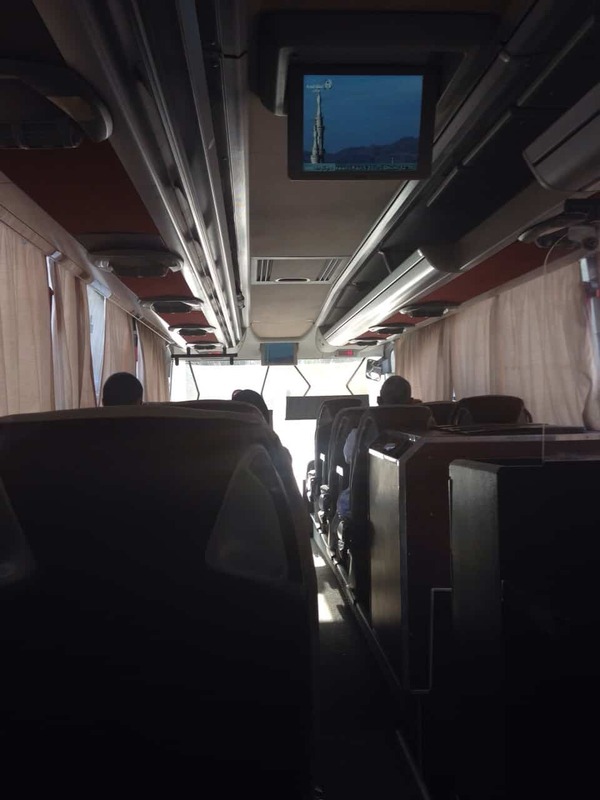 is there a saptco coach service from jeddah airport to Makkah ? are these coaches wheelchair friendly? They are a standard coach service, so it will be the same anywhere else. You can put the wheelchair in the bottom I assume if the person can get through the stairs. Customer traveling to Saudi Arabia for Hajj or Umrah cannot rent a car. Customers wanting to rent a car must have either a Business, Commercial or Visitors visa; or be a Saudi National, Resident, or a Citizen of the GCC (Gulf Cooperation Council) countries. Without this type of Visa or citizenship you will be unable to enter the country and you will be unable to rent. Note: Under Saudi law, women are not allowed to drive. Do you have information about rent car company that can be used for Umrah? I think the policy is clear, you cannot really rent a car. Which I do agree with. Driving in Saudi is crazy and having pilgrims to drive there will make it even worse. So Sadly nothing can be done. Would you kindly update us about the new train service and how traveling between Jeddah airport and Maccah would be. I want to travel there with my mother and 18 year old son IA in April. We would only be there for a short while for Umrah. Therefore it would be very helpful if we could get as much info as possible for the trip. There is no train service you will have to take a taxi from the airport to take you to Makkah. You can look up my guide for this inshaAllah on transportation. The train is not ready yet. I am planning to travel to Medinah to visit a few touristic and historical places with a girlfriend of mine. As we both are muslims ladies, may I know if it is required to have a mahram to travel with us or it is alright to travel just two of us around Medinah? You cannot visit Makkah or Medina without a mahram. Insha Allah, I am arriving Jeddah on Dec 22nd/18 to perform Umrah with my family ( 5 passengers). Staying 1 night in Makkah and 1 night in Madinah. I will need a ride from Jeddah to Makkah on Dec 22nd, Makkah to Madinah on Dec 23rd and Madinah to Jeddah on Dec 24th. What is your recommendation for this travel plan? I’m also arriving Makkah on Dec 22 (with 5 faimly members) inshaAllah.. 4 days in makkah thn 6 days in madina thn again 4 days in Makkah..inshaAllah..
Assalamualaikum sister, I made an online booking for a cab. But I’m quite worried if it is a scam. How can I check if that taxi provider is a valid/authorized one? Salams Farhana, I am very sorry to hear, I am not sure how you can check this. Are there any reviews of the company? Is there any travel agents in Glasgow that can provide the Umrah visa only You intend to fly from Madinah to Jeddah, then by road to Makkah. If you don’t find an agent in Scotland, Prince visa will issue an Umrah visa alone. In respect of transportation would you recommend hiring a car ? So you can drive and go where you want to go.